I participated in an Influencer Activation on behalf of Influence Central for Sears. I will receive a promotional item to thank me for participating. When I heard about the FitStudio campaign for Sears, I knew I wanted to participate. Sears is an exclusive retailer for Nordic Track fitness equipment and since I love my Nordic Track Treadmill and my Nordic Track Bike, I thought this would be a good fit for me. First off, what is FitStudio? FitStudio is a one stop resource for fitness online. It offers product reviews on equipment and gear, daily workouts, challenges that you can participate in, promotions, and REWARDS. That's right, you actually earn rewards ( like cash) for working out. The best part is that it is FREE! You'll earn 2000 points for signing up. You'll earn 2000 points for completing your profile. You'll earn 1000 points for connecting a device like a fitbit, Up by Jawbone, MyFitnessPal, MapMyFitness, RunKeeper, and several other devices. Earn 100 points when you walk or run 2 miles per day. Earn 100 points when you burn 100 active calories. 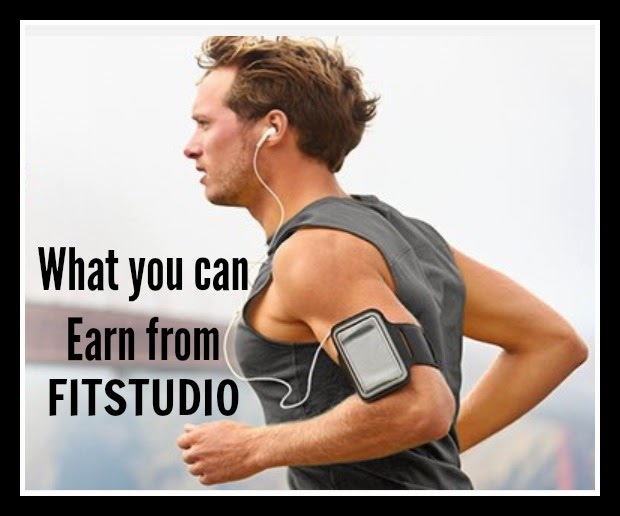 Earn 100 points when you share FitStudio content. Earn 100 points when you share your progress. You can redeem your points at Sears or Kmart. I just started with this program and already I have earned $9.00. But wait there is SO much more that can be done with FitStudio. Each user has a Dashboard filled with a plethora of fitness activities and tips. Do you want to challenge yourself a bit more? FitStudio allows you to participate in challenges each month. I looked up some of the past challenges and it looked like they had a Turkey Trot and a Frosty Fitness Challenge. Shown is the current challenge for January. You can of course customize your own workouts too, find articles on fitness and nutrition, and look up gear reviews. Oh I could spend so much time on theses gear reviews. I got a new Nordic Track bike for Christmas so I of course had to pull that model number up to see what they said about it. (Spoiler alert, they love it). Every review includes a video testimonial, an overall score, and "cool tips callouts", which highlight unique features of that particular piece of equipment. Check out the reviews HERE. FitStudio also has a Personalized DEAL OF THE DAY feature. Members can select the type of gear or equipment they are shopping for and Deal of the Day for that item will be loaded into their Shop My Way Account ( also on FitStudio). What is nice about this is that you can use the points that you earn for working out towards your Deal of the Day item. Would you participate in a program like FitStudio? Have you ever earned rewards for your daily workouts? Normally I don't participate in workout apps or site that track my workouts for points. But since you're telling me I can earn shopping money, then I may have to make an exception. Yes, that is quite the incentive! I've never heard of this, but a creative way for Sears to engage with its customers/potential customers. I agree! I think it's great for Sears since they already sell high end fitness equipment. No doubt we will be buying fitness items anyway, so why not earn $ towards them. This is really awesome! I love the the points you can redeem for real deal things! Yes, earning points is definitely a good incentive! This looks fun. I am going to see if it is available to Canadians too. Oh, I hope it is! love it! I was using EveryMove but they cut out the rewards program, :( I am headed over to the web site now! I hope you sign up Mary Beth! This sounds pretty cool! I need to check it out! Let us know how you like it Jaime! Sounds awesome! Thanks for the tip. Definitely looking into it! Thanks for stopping by Jennifer. This looks awesome! I hope it is available in the UK too. It's online so I wouldn't see why not. This sounds great! I'll definitely check it out! Huh...This looks very interesting! I am definately going to have to look into it further! I've never heard of fit studio. I love challenge ideas like that. Hey if I can get rewarded for working out, I'm all in! I actually like the idea of the challenges you can do every month too! So cool. Wish it was more than just Sears and Kmart, we don't have those around here. We need to invent a Target fit app. I'm sure you could buy things online! It is actually compatible with more than I have listed. You should go to the website and check it out. It may be compatible with something you are already using! I thought it was a great incentive too!